Russia must halt its covert development of a banned cruise missile system or the United States will seek to destroy it before it becomes operational, Washington’s envoy to NATO said on Tuesday. Question: And the second question, Secretary General Stoltenberg, he began with that Russia’s actions are in breach with the INF Treaty. Will you tell us tomorrow what will be discussed about this issue? Thank you very much. Hutchison: On the issue of your second question on the INF Treaty. We have been trying to send a message to Russia for several years that we know they are violating the treaty. We have shown Russia the evidence that we have, that they are violating the treaty. They are building a medium-range ballistic missile in violation of the INF. That is a fact which we have proven. 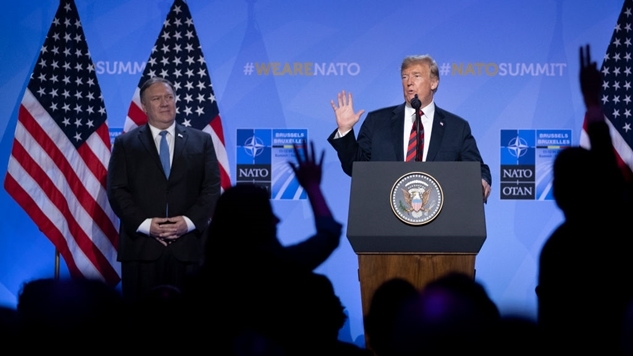 We have been asked by our allies to consult with them on this issue which we are going to do, which we have done, and we will be even more specific, I believe, in the next two days with the evaluations that are documented that we have uncovered from Russia’s actions on the INF Treaty in violation. The United States does not want to withdraw from the treaty. We certainly don’t intend to violate the treaty. So we are asking our allies for their suggestions on a way forward that would bring Russia into compliance, because that is our goal. Russia in compliance. But if Russia continues to say they are not violating when the evidence is clear that they are, then diplomacy needs to be strengthened, and we need to look for other ways to bring Russia to the table on this issue. It’s very important. INF stands for Intermediate-Range Nuclear Forces. The treaty was ratified on June 1st, 1988 between the United States and the Soviet Union. The agreement eliminated all nuclear and conventional missiles and their launchers under 3,420 miles. By 1991, over 2,600 missiles had been eliminated, and the treaty was seemingly doing what it intended to do. In 2007, Vladimir Putin declared that the treaty did not serve Russia’s interests, and Russia began testing missiles in defiance of the INF Treaty. The reason why is that other countries in Asia are not bound by this treaty, and a big part of Russia’s motivation is to match the production of intermediate and short range nuclear capabilities from countries like China. In 2014, the United States formally notified Russia of their breach of this treaty, effectively kicking off a dispute which made news today thanks to Reuters’ incorrect framing of the U.S. ambassador to NATO’s words. Reuters said that the U.S. “would” destroy banned Russian warheads if necessary, yet that’s not the way that the question was posed or answered. Again, let’s go back to the transcript. Question: Ma’am, can you be more specific what kind of new information that you are bringing to the table regarding the breach of the INF Treaty? And more explicitly also, what kind of countermeasures that you are considering. Hutchison: The countermeasures would be to take out the missiles that are in development by Russia in violation of the treaty. So that would be the countermeasure eventually. We are trying not to do anything that would violate the treaty on our side, which allows research, but not going forward into development, and we are carefully keeping the INF Treaty requirements on our side, while Russia is violating. We have documented on numerous occasions that Russia is violating. We have shown Russia that evidence. Some of our allies have seen that evidence. All of our allies have seen some of that evidence. I think it is very important that we have the capability to deter, not only for European defense but for American defense. We have an intermediate range risk from Russia as well. So I think it is important that we continue to do everything as an alliance to put pressure on Russia to come forward, and first of all admit that they are in violation, and then secondly, to stop the violations. Because they are clearly doing it, our allies know that, our allies have spoken at the Summit with a clear indication that Russia must stop these violations. As you can see, the question was clearly posed as a hypothetical and while Hutchison did say “would,” it was in the context of “this would be the countermeasure, per longstanding policy”—not “we are planning to do this.” It’s simply disingenuous to read her response as if she was speaking literally, especially since she ended her response talking about diplomacy. It’s crystal clear to anyone familiar with how bodies like NATO act that Hutchison was not speaking about actual intent, but longstanding policy that enables a range of outcomes. She could have been clearer about what they plan to do and what the treaty enables them to do, but, well, welcome to the vagaries of the Trump administration. Never attribute to malice that which can be adequately explained by stupidity. Bottom line: this is a pretty irresponsible headline and framing of the press conference from Reuters. They portray diplomacy as some afterthought, while the hypothetical laid out is the main thrust of their piece, when chronologically, the exact opposite happened. I woke up today with the entire internet in hysterics, since reading their report sure does make it look like the United States is prepping to start World War III with Russia—but one glance at the transcript proves that the situation is far more nuanced than Reuters portrayed it to be. Russia’s violation of the INF treaty is likely more about China than the United States, and they have a point in arguing that it is a relic of a different era. Regardless, the machinations of diplomacy have been playing out for at least four years on Russia’s violation of this treaty, and this is just another episode in a long running series that few people have been paying attention to, and we will likely forget by tomorrow, as it is crystal clear from Hutchison’s comments that war with Russia is not imminent.